Objective Morphine is frequently used in acute coronary syndrome (ACS) due to its analgesic effect, it being recommended in the main cardiology guidelines in Europe and the USA. However, controversy exists regarding its routine use due to potential safety concerns. We conducted a systematic review of randomised-controlled trials (RCTs) and observational studies to synthesise the available evidence. Data sources CENTRAL, MEDLINE, EMBASE and trial registries. Eligibility criteria for selecting studies We included RCTs and observational studies evaluating the impact of morphine in cardiovascular outcomes or platelet reactivity measures. Data extraction and synthesis Data were screened, extracted and appraised by two independent reviewers. The data were pooled results using a random-effects model. Outcomes included in-hospital mortality, major adverse cardiovascular events (MACE), platelet reactivity (using VerifyNow) and bleeding, reported as relative risk (RR) with 95% CI. We assessed the confidence in the evidence using the Grading of Recommendations Assessment, Development and Evaluation (GRADE) framework. We followed the Meta-analysis Of Observational Studies in Epidemiology and Preferred Reporting Items for Systematic Reviews and Meta-Analyses guidelines. Results Five RCTs and 12 observational studies were included, enrolling 69 993 participants. Pooled results showed an increased risk of in-hospital mortality (RR 1.45 [95% CI 1.10 to 1.91], low GRADE confidence), MACE (RR 1.21, 95% CI 1.02 to 1.45) and an increased platelet reactivity at 1 and 2 hours (59.37 platelet reactivity units [PRU], 95% CI 36.04 to 82.71; 68.28 PRU, 95% CI 37.01 to 99.55, high GRADE confidence) associated with morphine. We found no significant difference in the risk of bleeding. We found no differences in subgroup analyses based on study design and ACS subtype. Conclusions Morphine was associated with an increased risk of in-hospital mortality and MACE but the high risk of bias leads to low result confidence. There is high confidence that morphine decreases the antiplatelet effect of P2Y12 inhibitors. We assessed data from both randomised trials and observational studies. The risk of bias across most observational studies is high, which raises concerns in pooling data with the far smaller randomised trials. To reduce the impact of the potential bias, before meta-analysis we adjusted the within-study variance–covariance matrix of observational studies at a critical risk of bias using a precision correction, a weight factor that provides more conservative pooled estimates. Key data were not adequately reported across many of the included studies. We used the Grading of Recommendations Assessment, Development and Evaluation approach to appraise the available evidence. Antiplatelet agents (aspirin and P2Y12 inhibitors), anticoagulants and coronary revascularisation are the mainstay in the early treatment of acute coronary syndrome (ACS), and their use likely improves prognosis.5–7 In both Europe and the USA, morphine, a potent analgesic that is a competitive agonist of μ-receptors in the central nervous system and smooth muscle, is recommended for pain control in the ACS setting.7 However, the activation of opioid receptors in the myenteric plexus decreases gut motility and secretion, inhibiting the activation of P2Y12 inhibitors by decreasing their absorption and bioavailability.8 There is conflict regarding the possibility that morphine interferes with P2Y12 inhibitors in the achievement of an adequate antithrombotic milieu,7 9 10 which may decrease the efficaciousness of antiplatelet drugs, if these are given concurrently with morphine. We conducted a systematic review of randomised-controlled trials (RCTs) and observational studies to evaluate the safety of morphine use in ACS, hypothesising that we would find a clinically meaningful result. 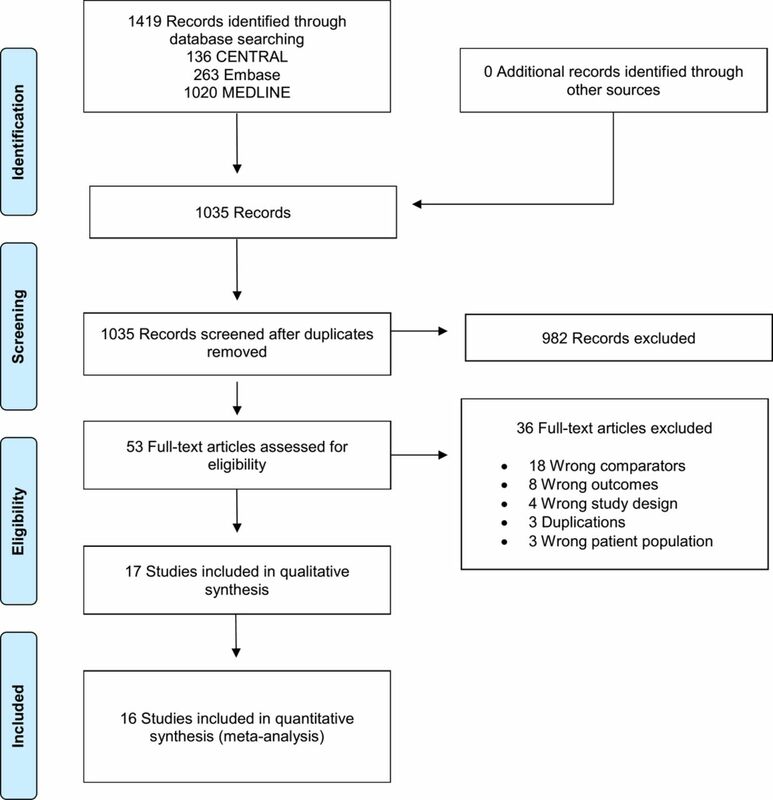 This systematic review followed the reporting principles of Meta-analysis Of Observational Studies in Epidemiology and Preferred Reporting Items for Systematic Reviews and Meta-Analyses.11 12Patients and public were not involved in this review. We considered longitudinal studies (ie, RCTs and observational studies) evaluating the impact of morphine in cardiovascular outcomes or platelet reactivity measures. The target population was patients with ACS, which can be either ST-elevated myocardial infarction (STEMI) or non-ST elevated acute coronary syndrome (NSTE-ACS).13 Studies had to evaluate morphine (irrespective of the administration route or dose) against placebo, control (no intervention arm) or any other analgesic non-opioid drug. Potentially eligible studies were identified through an electronic search of CENTRAL (Cochrane Library), MEDLINE, EMBASE, and clinicaltrials.gov from inception to November 2018 (online supplementary material). No language restrictions were applied. We cross-checked reference lists of reports for potential additional studies. Two reviewers (GSD and either FBR or ANF) independently screened the titles and abstracts yielded by the search and assessed the full texts of the selected studies to determine the appropriateness for inclusion. Disagreements were resolved through consensus or by a third reviewer (DC) serving as final arbitrator. The reasons for exclusion were recorded at the full-text screening stage. Two reviewers (ANF and GSD) extracted study data following a pre-established data collection form. Data from studies’ plots were retrieved through Plot Digitizer V.2.6.8. When studies presented different estimates of the outcome of interest, we extracted the most precise or adjusted measures. Risk of bias was independently evaluated by two authors (GSD and ANF) using different tools according to study design. For RCTs, we used the Cochrane risk of bias tool, where domains were qualitatively classified as at high, unclear or low risk of bias.17 The overall risk of bias for each RCT was divided as high or low risk, with high risk being those RCTs in which at least one domain was assessed at a high risk of bias, or more than three domains were had a rating of unclear. For observational studies we used the ROBINS-I tool, assessing the following domains: confounding, selection of participants, classification of intervention, deviations from intervention, missing data, measurement of outcome and selection of reported results.18 These domains were qualitatively classified as at critical, serious, moderate or low risk of bias. The overall risk of bias for each observational study was divided as critical or non-critical, following ROBINS-I criteria. Risk of bias graphs was derived from these tools. When observational studies were assessed as having a critical risk of bias, we adjusted the within-study variance–covariance matrix using a precision correction of 0.1 that will provide more conservative pooled estimates.26 27 This conservative weight factor was based on expert-based clinical grounds. Patients and the public were not involved in this review. The search returned 1419 records, resulting in 1035 records after removing all duplicates. After title and abstract screening, 53 articles were assessed for full-text screening, with 17 being included for qualitative and quantitative syntheses, 5 being RCTs29–33 and 12 being observational studies.10 34–44 We did not retrieve any unpublished study (figure 1). The characteristics of the included studies can be seen in table 1 and table 2. Study publication dates ranged from 1969 to 2018, with sample sizes between 12 and 57 039 participants. The largest study, Meine et al,34 a retrospective cohort study, accounted for 81% of the participants in this review. Morphine administration was variable across the included studies, with six of the observational studies10 34 35 40 42 45 not reporting information regarding dose and number or mode of administration. Among RCTs, morphine administration was intravenous or intramuscular at a dose between 2 and 10 mg, either in single or multiple administrations. The forms of antiplatelet therapy used across studies were varied, and firm conclusions cannot be made. We judged two of the five RCTs to be at a high overall risk of bias, one31 due to having unclear risk of bias in all but one domain, and the other29 due to a high risk of performance and attrition bias. All observational studies were at risk of bias due to confounding, and all but one36 were at moderate risk of selection of study results. Grendahl and Hansteen38 was additionally at moderate risk of bias due to measurement of outcome. Overall, two observational studies were at critical risk of bias,34 35 seven were at serious risk of bias36 38 39 and three were at a moderate risk of bias10 37 40 (online supplementary material). Four RCTs (n=2237) and seven observational studies (n=63 112) contributed with data for this outcome. Adjusted pooled results showed an increased risk of in-hospital mortality in the morphine group (RR 1.45; 95% CI 1.10 to 1.91; I2=0%; figure 2). Subgroup analysis based on study design (p=0.67 for interaction; figure 2) and ACS subtype (STEMI RR 1.05; 95% CI 0.57 to 1.94; I2=0%; NSTE-ACS RR 1.57; 95% CI 1.15 to 2.14; I2=0% and p=0.25 for interaction) were both non-significant. Sensitivity analysis by excluding studies at critical risk of bias showed no differences between morphine and control (RR 1.41; 95% CI 0.87 to 2.27; I2=0%; n=5872 participants). The GRADE confidence in this estimate is low. Forest plot of in-hospital mortality according to morphine use, subgroups according to study design. IV, inverse variance; NSTE-ACS, non-ST elevated acute coronary syndrome; RCT, randomised controlled trials; STEMI, ST-elevated myocardial infarction. Three RCTs (n=375) and seven observational studies (n=61 054) contributed with data for this outcome. Adjusted pooled results showed an increased risk of MACE in the morphine group (RR 1.21, 95% CI 1.02 to 1.45; I2=0%; figure 3). Subgroup analysis based on study design (p=0.44 for interaction; figure 3) and ACS subtype (STEMI RR 1.20; 95% CI 0.71 to 2.03; I2=0%; NSTE-ACS RR 1.21; 95% CI 1.01 to 1.46; I2=0% and p=0.98 for interaction) were both non-significant. 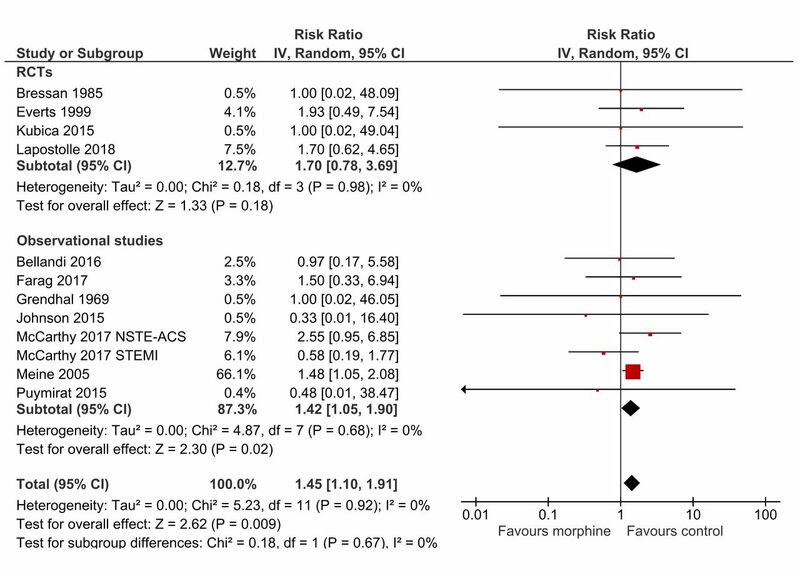 Sensitivity analysis by excluding studies at critical risk of bias showed no differences between morphine and control (RR 1.40, 95% CI 0.85 to 2.30; I2=0%; n=1952). The GRADE confidence in this estimate is low. Forest plot of MACE (major adverse cardiovascular events) according to morphine use, subgroups according to study design. IV, inverse variance; RCTs, randomised controlled trails. One RCT (n=70) and two observational studies (n=482) contributed with data for major bleeding, while three RCTs (n=375) and three observational studies (n=57 647) contributed with data for minor bleeding. No differences were found between morphine and control in the risk of either major (RR 0.62, 95% CI 0.18 to 2.12; I2=0%) or minor (RR 0.62, 95% CI 0.18 to 2.12; I2=40%) bleeding (online supplementary material). Subgroup analysis based on study design and ACS subtype were both non-significant (major bleeding: p=0.85 and p=0.85 for interaction, respectively; minor bleeding: p=0.20 and p=0.20 for interaction, respectively). The GRADE confidence in these estimates is low for major bleeding and very low for minor bleeding. We present data from 1 and 2 hours after morphine administration, as these are likely to be the most clinically meaningful timepoints. Two RCT (n=82) and two observational studies (n=228) contributed with data for this outcome. One hour after administration, morphine was associated with increased platelet reactivity, with an MD of 59.37 platelet reactivity units (PRU) (95% CI 36.04 to 82.71; I2=23%; figure 4). Two hours after administration, morphine remained associated with increased platelet reactivity (MD 68.28 PRU, 95% CI 37.01 to 99.55; I2=28%; figure 5). Subgroup analysis based on study design and ACS subtype were both non-significant at both timepoints (p=0.25 for interaction for both timepoints; p=0.24 for interaction for both timepoints, respectively). The GRADE confidence is high for this outcome at both timepoints. Forest plot of platelet reactivity at 1 hour postmorphine administration, using the VerifyNow method, subgroups according to study design.IV, inverse variance; RCTs, randomised controlled trails. Forest plot of platelet reactivity at 2 hours postmorphine administration, using the VerifyNow method, subgroups according to study design. IV, inverse variance; RCTs, randomised controlled trails. We additionally pooled results using the three trials that reported results using the MEA method.30 39 40 These results were consistent with those using the VerifyNow method at both 1 hour (MD 27.80, 95% CI 16.03 to 39.57, I2=24%) and 2 hours after morphine administration (MD 19.99, 95% CI 1.52 to 38.46, I2=82%). 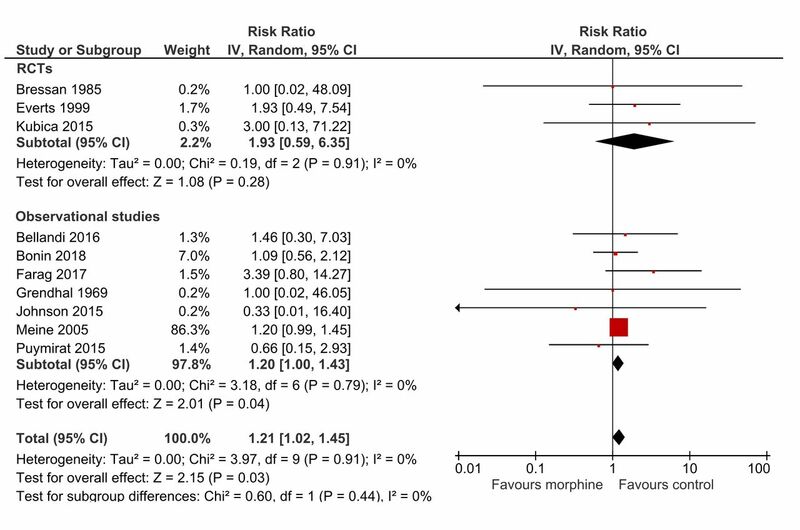 We found no differences associated with morphine use, namely regarding the risk of cardiogenic shock (RR 1.48; 95% CI 1.00 to 2.18; I2=0%), heart failure (RR 1.17; 95% CI 0.91 to 1.51; I2=33%), hypotension (RR 0.93; 95% CI 0.49 to 1.74; I2=5%), nausea/emesis (RR 1.84; 95% CI 0.80 to 4.23; I2=44%), respiratory insufficiency (RR 0.77; 95% CI 0.31 to 1.91; I2=0%) or stent thrombosis (RR 1.13; 95% CI 0.67 to 1.92; I2=0%) (online supplementary material). Our main findings were as follows: (1) morphine was associated with an increased risk of in-hospital mortality and MACE; however, high risk of bias led to low confidence in the results; (2) morphine decreased the antiplatelet effect of P2Y12 inhibitors in the first hours of ACS, and the risk of bias associated with this objective measure was considered to be low. Despite the widespread use of morphine in chest pain and anxiety relief in patients with ACS, conflicting data about its clinical impact has recently come to light.30 The activation of opioid receptors in the myenteric plexus decreases gut motility and secretion, inhibiting the activation of drugs whose action is directed at the P2Y12 protein and decreasing its absorption and bioavailability. Moreover, morphine is also known for its proemetic and antiperistaltic effects, which can further contribute to the decreased absorption of antiplatelet drugs. This systematic review was planned and designed to evaluate the safety outcomes associated with morphine use in ACS. Pooled data RCTs and observational studies showed that treatment with morphine in patients with ACS is associated with a significant increase risk of in-hospital mortality, MACE and platelet reactivity. Unexpectedly, we did not find an increased risk of nausea/emesis associated with morphine. This raises the likelihood that the reduction of gut secretion and motility is the core effect through which morphine decreases the activation of P2Y12 drugs. With regard to platelet reactivity, we believe that the magnitude of the difference found supports a change in clinical practice, moving away from a recommendation to use morphine in ACS to recommending not using it routinely. The strength of this recommendation may be controversial due to the nature of the trials used and the other outcomes in this review not being statistically significant. An important concern when combining randomised and observational data is the extent to which the participants and clinical setting are sufficiently similar to justify their pooling. On this account, the results of this review are robust since we found low heterogeneity across the outcomes of interest and the fact that none of the subgroup analyses comparing RCTs versus observational studies were statistically significant. Further proof of the consistency of the results is that no subgroup analysis showed a difference between STEMI and NSTE-ACS. However, due to concerns over risk of bias across studies, we assessed the certainty in the evidence as low, despite there being little concern regarding inconsistency, indirectness or lack of statistical power. The key limitation of this review comes from the key limitation of most observational research, namely confounding. In a conservative approach, we attempted to minimise the impact of observational studies and their bias in the estimates by applying a correction factor previously used in other meta-analysis.26 27 Nevertheless, we must recognise that this adjustment is artificial and limits our results. Another limitation regards the possible differences in the doses and route of administration of morphine that were not available in most of the included studies. Physicians may administer morphine to patients with more severe forms of chest pain, which may correspond to a more severe underlying ACS. This means that the increased risk of negative clinical outcomes could come as a result of patients being given morphine, or, alternatively, from the fact that morphine is usually reserved for the sickest patients. Because the included observational studies were substantially larger than the RCTs, including them in the meta-analysis could increase the risk of producing a biased result with an undue degree of statistical precision. To minimise this risk, we used methods to decrease the weight given to the largest and most biased studies, providing a more conservative estimate based on the available evidence. In doing so, we have produced the first and only systematic review to date that evaluates this highly relevant clinical question. This systematic review raises concern about the use of morphine in patients with ACS and challenge the current clinical recommendations for its use in ACS. Most data come from studies at high risk of bias when evaluating the true effect of morphine in this setting. As such, a low-bias, adequately powered RCT designed to evaluate this question would be of significant scientific and clinical value. However, there is high certainty that morphine decreased the antiplatelet effect of P2Y12 inhibitors in the first hours of ACS. UID/BIM/50005/2019, project funded by Fundação para a Ciência e a Tecnologia (FCT)/ Ministério da Ciência, Tecnologia e Ensino Superior (MCTES) through Fundos do Orçamento de Estado. Organization. WH. Cardiovascular Diseases. 2017 http://www.who.int/cardiovascular_diseases/en/ (accessed 10 Oct 2017).
. European cardiovascular disease statistics. Brussels: European Heart Network, 20172017.
. Chapter 8: Assessing risk of bias in included studies. In: Higgins JPT CR , Chandler J , Cumpston MS , eds. Cochrane Handbook for Systematic Reviews of Interventions version 520. Cochrane, 2017. www.training.cochrane.org/handbook. (updated Jun 2017).
. Chapter 10: Addressing reporting biases. In: Higgins JPT CR , Chandler J , Cumpston MS , eds. Cochrane Handbook for Systematic Reviews of Interventions version 520. Cochrane, 2017. www.training.cochrane.org/handbook. (updated Jun 2017).
. Chapter 11: Completing ‘Summary of findings’ tables and grading the confidence in or quality of the evidence. In: Higgins JPT CR , Chandler J , Cumpston MS , eds. Cochrane Handbook for Systematic Reviews of Interventions version 520. Cochrane, 2017. www.training.cochrane.org/handbook. (updated June 2017).
. Analgesic treatment in acute myocardial infarction: a comparison between indoprofen and morphine by a double-blind randomized pilot study. Int J Clin Pharmacol Ther Toxicol 1985;23:668–72.
. The effect of morphine on blood pressure and cardiac output in patients with acute myocardial infarction. Acta Med Scand 1969;186:515–7. Contributors DC and GSD conceived the idea for the protocol and made the main contribution to planning and preparation of timelines for its completion. DC and GSD planned the data extraction and statistical analysis, as well as of risk of bias, quality of evidence and completeness of reporting assessments. GSD designed the tables and wrote the first draft of the manuscript, which was then reviewed and amended by ANF, DC, FBR, FP, JC and JJF. All authors then approved the final written manuscript. DC is the guarantor for the work. Funding UID/BIM/50005/2019, project funded by Fundação para a Ciência e a Tecnologia (FCT)/ Ministério da Ciência, Tecnologia e Ensino Superior (MCTES) through Fundos do Orçamento de Estado. Competing interests JJF received speaker and consultant fees from Abbott, Bial GlaxoSmithKline, Grunenthal, Lundbeck, Merck-Serono, Merck Sharp and Dohme, Novartis, TEVA, and Solvay. FJP received speaker and consultant fees from Astra Bayer, Boehringer Ingelheim, Daiichi and Sankyo Zeneca. All remaining authors declare no competing interests. Data sharing statement No unpublished data are available.